Our 7 day weather forecast for Glastonbury updated throughout the day, making it ideal for planning leisure activities, travel and events. Read more about our weather forecasts. On Tuesday 23rd April 2019 the sun will rise at 06:00 and will set at 20:20. It will be a mild day, with temperatures reaching around 22.4°C. A light shower is possible, 2mm of rainfall is possible today. There will be a gentle breeze in the air today, with a maximum expected wind speed of 15mph. On Wednesday 24th April 2019 the sun will rise at 05:58 and will set at 20:21. It will be a mild day, with temperatures reaching around 13.5°C. A few showers are expected, 3mm of rainfall is possible today. There could be quite a strong breeze in the air today, with a maximum expected wind speed of 23mph. On Thursday 25th April 2019 the sun will rise at 05:56 and will set at 20:23. It will be a mild day, with temperatures reaching around 13°C. A few showers are expected, 3mm of rainfall is possible today. It could be quite a gusty day today, with a maximum expected wind speed of 30mph. On Friday 26th April 2019 the sun will rise at 05:54 and will set at 20:25. It will be a mild day, with temperatures reaching around 13.4°C. Some moderate to heavy rain is expected, 8mm of rainfall is possible today. It could be quite a gusty day today, with a maximum expected wind speed of 29mph. On Saturday 27th April 2019 the sun will rise at 05:52 and will set at 20:26. It will be a mild day, with temperatures reaching around 10.6°C. Today is expected to be a dry day, with a very low chance of rain. It could be quite a gusty day today, with a maximum expected wind speed of 28mph. On Sunday 28th April 2019 the sun will rise at 05:50 and will set at 20:28. It will be a mild day, with temperatures reaching around 14.6°C. A light shower is possible, 1mm of rainfall is possible today. It will be quite a breezy day, with a maximum expected wind speed of 26mph. On Monday 29th April 2019 the sun will rise at 05:48 and will set at 20:30. It will be a mild day, with temperatures reaching around 8.3°C. Today is expected to be a dry day, with a very low chance of rain. There will be a gentle breeze in the air today, with a maximum expected wind speed of 14mph. Our weather forecast for Glastonbury is updated throughout the day and has been found to be very reliable for planning activities such as days out, leisure, travel, events, fishing, golf and gardening. The Flying Dragon's Nest self catering garden flat is a fantastic place to stay in Glastonbury. 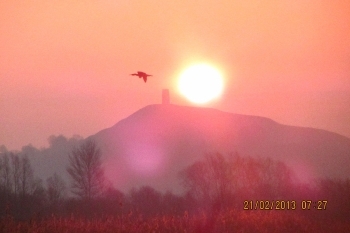 Not only do we have amazing views and gorgeous sunsets, but we are only a five minute walk from Glastonbury High Street and the Abbey Ruins and a fifteen minute walk from the Tor and Chalice Well Gardens. We can accommodate a couple very comfortably in our cosy bedroom with king sized bed and we also have a double sofa bed in the living room. The kitchen is well equipped with dishwasher, oven, and microwave and our roomy bathroom has a large shower and washing machine. You can lounge on our deck and patio to watch the sunset and perhaps see a badger or two later in the evening. We look forward to welcoming you to our lovely apartment.